There are many different types of camp axes that are on the market and while most of them are the same you still have a few on the market that differ from each other. Usually they are different from each other because of how they are designed and what they are used for. 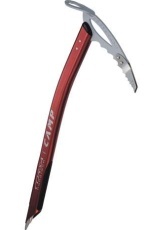 But there is one type that is different in more ways than just this – the camp ice axe. What is a camp ice axe? This specially designed axe is used by ski mountaineers and different types of alpine travelers. It is a multi-purpose snow and ice tool that helps mountaineers to climb up and down mountains that are covered in snow and ice. It is also used to help people who have fallen down a snowy hillside to stop themselves by digging the axe into the side of the mountain. The ice axe is designed in five different parts. These parts are what separate it from the standard camp axe that we are used to seeing. In fact this type of axe looks nothing like those. This part of the ice camp axe is normally made with steel and is designed with a pick or adze. There is a hole in the center of it that allows people to install a wrist leash. When keeping it securely around their wrist they are better able to use it and keep it on them. This is the pointed end of the head that is normally curved. It has toothed edges to it and is built to fit more securely into the ground and to support large amounts of weight when someone is trying to stop themselves from falling down the mountain. The adze is a wide, flat end of the head that is used to cut through the snow and ice. This makes it easier for people to walk through when it is too high. The shaft can sometimes be straight or just a little bit angled. It is usually wider from the front to the back and flat on the sides with smooth ends that are rounded off. These are made using aluminum, titanium, fiberglass, carbon filament, and Kevlar to make it lightweight. This part of the camp ice axe is a steel point that is situated of the base of the shaft. It is used for balance and safety. People use it when the axe is being used and held on the head like a walking stick.